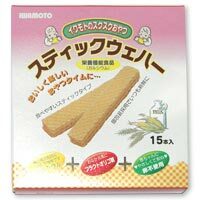 The wafer which is used as a baby food in Japan. We finished it in easy over-optimism to taste of a delicate baby. We can stand by the individual packing that is easy to carry it, a hand of a baby, and size at just at, an always starving baby are satisfied with a small mouth very much.